Beacon Heights Preschool teaches kids aged 2-5 and used Stockbridge's grant to purchase materials for a "bird day" to teach children about nature and stimulate interest in wildlife with an emphasis on birds. 17 students (and their parents/caregivers) learned about bird anatomy, behavior, habitat, and food preferences. Crafts included making birdhouses, bird feeders, and seed bombs to grow native plants at home. Other activities allowed children to use various tools to mimic different types of bird beaks so that they could pick up appropriate food items for different species, and to weave nests similar to those made by birds. All families received a National Geographic Kids bird field guide to continue learning about birds at home. Back when your grandparents’ own grandparents were children, we had a kind of bird here in Indiana called a Passenger Pigeon. There were so many of them that they made huge flocks, that made the sky dark for hours and hours! That’s a lot of birds! They lived right here in Indiana: ever hear of Pigeon River in LaGrange County? You probably know the bird called a Mourning Dove. Passenger Pigeons were like that, only bigger and brighter orange in front. And when they’d fly, their wings didn’t make a whistling noise the way Mourning Doves’ do. Mourning doves say “Coo, coo, coo” but we don’t know what Passenger Pigeons said: because nobody had invented recording devices yet! Well, there were so many Passenger Pigeons that people thought they’d last forever. Hunting them was easy because they nested near each other, in huge colonies. So people hunted them with guns or caught them in nets. They were good to eat, but so many were killed that they were fed to pigs or just wasted. And they packed them in barrels, and shipped them to New York City on the train. Refrigeration wasn’t very good, so I bet they were pretty gross when they got to New York City! One thing people didn’t think about was that Passenger Pigeons only laid one egg, so they only had one baby every summer. When the hunters came, even if the parents didn’t get killed, they were so scared they flew away and didn’t take care of their one baby. I told you this was a sad story! Finally people started to think “Where are those huge flocks we used to see?” Michigan passed some laws to protect them while they were nesting, but nobody enforced it. Then some Passenger Pigeons were put in cages to keep them safe. But it was too late! They really didn’t do very well in captivity. The very last pair of Passenger Pigeons lived in the Cincinnati Zoo. Their names were George and Martha. Guess who they were named for? That’s right: George and Martha Washington! After a few years George died and Martha was all alone. Finally Martha died, 100 years ago, in September 1914. People were very sad about that, and they got Congress to pass laws that protected native birds, such as the Lacey Act, the Migratory Bird Treaty of 1918, and now we have the Endangered Species Act. You can ask your grandma or grandpa if they remember THEIR grandma or grandpa ever talking about Passenger Pigeons. Know what happened to Martha after she was dead? They froze her in a big block of ice and sent her to the Smithsonian Museum! She was stuffed, and you can see her if you go to Washington DC. Keep your cat indoors, because we don’t want to talk about what happens if a cat catches a bird. Don’t bother birds that are busy nesting and raising babies. Remember in this church we promise to “respect the interdependent web of all existence, of which we are a part.” We really don’t want to lose any more species, especially our own! I have here an origami Passenger Pigeon. I’ll put it on the altar to help us remember Martha, 100 years ago. And you can make some more like it in your classes. We might even save some to put on the Christmas tree! It started with her offer to transcribe a man's 50-year-old nature journal. It since has morphed into a fascinating journey back in time to get to know some of the Fort Wayne area's early conservationists. “To me, they are the unsung heroes,” said Terri Gorney, 53, of Fort Wayne, who started her work in 2007. Gorney, an interior designer and manager at Zeigler's Window Coverings in Fort Wayne, has always loved the outdoors. “I grew up an outdoor kid, a lake kid,” she said, noting she spent her summers with her grandmother at Pretty Lake in southeast LaGrange County. As an adult, she has volunteered for the past 10 years with the Indiana Department of Natural Resources. She also is an active member of local nature organizations the Stockbridge Audubon Society and ACRES Land Trust, and she is vice president of the Friends of the Limberlost, which supports the Limberlost State Historic Site in Geneva. 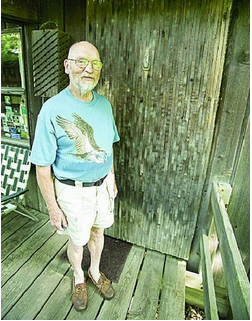 In 2007, while volunteering at the Nature Center at Pokagon State Park near Angola, Gorney saw a nature journal that recently had been given to park Interpreter Fred Wooley. In small, very neat handwriting, Maurice McClue of Angola had recorded observations about birds, animals, plants and trees from 1919 until just days before his death in 1957, Gorney said. The observations included things he noticed in Angola, where he worked as an attorney, as well as around Steuben County and on his family's 80-acre farm, which had been passed down from his grandfather and father to him. He donated the farm to the citizens of Steuben County at his death, with the stipulation it be named after his father, Charles, and never be developed, Gorney said. Now known as the McClue Reserve, it lies on Steuben County Road 400N about a mile east and just south of the Pokagon State Park exit on Interstate 69, about 45 minutes north of Fort Wayne. She since has published two other short books, one providing a biography of McClue and including his writing on nature and conservation, and the other a genealogical resource book on his family. Her efforts attracted the interest of ACRES, which asked her to write a feature article on the original owners, donors or caretakers of each of the 86 land parcels included in its more than 70 nature preserves. “I figure it is about a four-year project,” she said. She has written more than 21 articles so far and has about 15 in process, she said. ACRES has been including one article in each of its ACRES Quarterly publications. Gorney hopes the articles eventually can be compiled into a book. She does most of her research at the Allen County Public Library and at libraries in area counties. That digging has led her to many intriguing people; she finds McClue one of the most fascinating. In his writings, he describes inheriting his conservation outlook from his father, Gorney said. McClue recorded seeing 125 different species of birds, even documenting the bright-red cardinal's migration north to become a year-round resident in Steuben County, Gorney said. His notes also chronicle declines in wildflower species and changes as oak and hickory forests gradually filled with more beech and maple trees. McClue also seemed a man ahead of his time, Gorney said. In an era when many people wanted to drain lakes in northeast Indiana and turn them into farmland, McClue promoted the water bodies as important natural and economic assets, she said. “People need playgrounds. They need to get close to nature,” he wrote. The Steuben County Tourism Bureau now touts the county as the home of 101 lakes, including the Lake James chain, Hamilton Lake and Clear Lake. Cottages and homes surround most lakes, drawing people from northeast Indiana, southern Michigan, northwest Ohio and beyond. 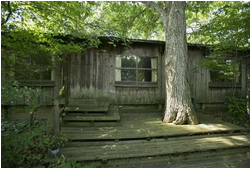 McClue strongly supported creation of Pokagon State Park at its present location, Gorney said. He also suggested the park be named after the Pokagon band of Potawatomi Indians, who once lived in that area. Park construction began in 1926. “He walked the grounds with Richard Lieber and was with Lieber when he picked out the site for the (park's) Potawatomi Inn,” Gorney said. Lieber is considered the “father” of Indiana state parks. On May 10, 1957, just 10 days before his death, McClue's journal entry cautioned against use of now-banned DDT to control insects, Gorney said. “If you kill the insects, the birds will leave,” McClue warned. •Jane Brooks Hine (1831-1916): Known as the “Bird Woman of Indiana,” Hine was born in Madison, Ohio, and moved with her husband to DeKalb County in Indiana in 1861. During her lifetime, Hine reported and documented about 400 bird sightings for the U.S. Geological Survey's Bird Chronology Program. 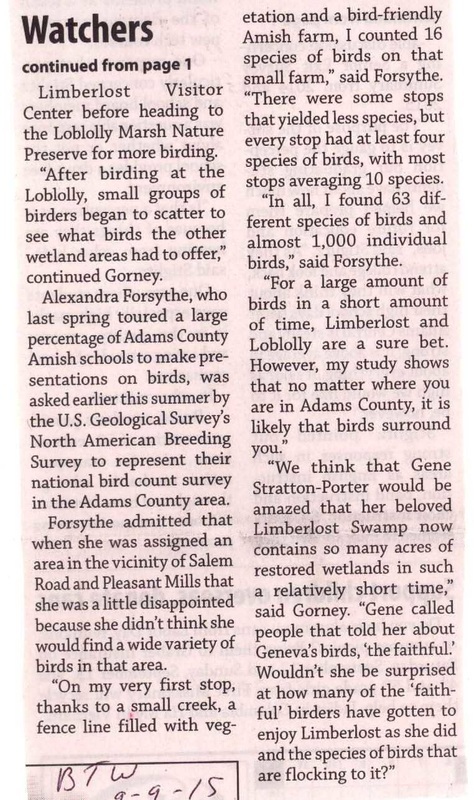 The reports included spotting the first bobolink in Noble County in 1883. Hine wrote bird-related articles for other publications and was a member of the National Ornithological Society. President Woodrow Wilson and his wife invited her to visit them in 1914 at their summer home. “She did make an impact in her own time because the London Academy of Sciences had a small obituary on her when she died,” Gorney said. During her research, Hine's descendants gave Gorney access to Hine's birding journals and poems she had written. Gorney plans to compile them into a book for people doing research at area libraries and at Oberlin College in Ohio, where Hine attended from 1852-1853. •Charles C. Deam (1865-1953): Born on a farm near Bluffton, Deam grew up to become a pharmacist with his own store in that city. A friend of noted author and scientist Gene Stratton Porter and her husband, Deam also became an amateur botanist. During his lifetime, he collected 73,000 plant, grass, tree and shrub specimens from all over Indiana, including driving 4,480 miles in 1921 to collect 1,741 specimens during 104 days in the field. He wrote books on Indiana's plant life, which still are consulted by scientists today, Gorney said. Deam served as state forester 1909-1913 and 1917-1928, and as state research forester 1928-1940. In 1982, the U.S. Congress named the 13,000-acre Charles C. Deam Wilderness in his honor. The land is part of Hoosier National Forest in southern Indiana. •Charles Stockbridge (1856-1934): The son of one of the first bookstore owners in Fort Wayne, Stockbridge grew up to become a longtime letter carrier and a nationally known bird expert. He served as president of the Fort Wayne Audubon Society, a birding organization, and reportedly was one of two people who took part in the first Christmas bird count here in 1910. The count collects data about bird populations and migration. Stockbridge also was active in taxidermy, and he assembled a large collection of mounted birds. After his death, the collection eventually was donated to Earlham College in Richmond. The local Audubon group later changed its name to the Stockbridge Audubon Society to honor him. He is buried in Lindenwood Cemetery. It could be seen as a joke about the retired couple’s relaxed gardening style – “benign neglect,” Ed calls it. But it’s also a reflection of the couple’s serious and lifelong approach to the environment – it was earned as an official designation from the National Wildlife Federation decades ago. 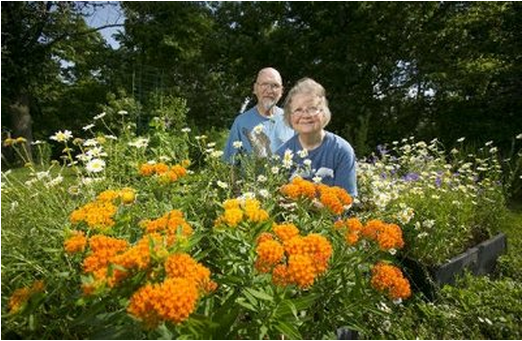 Ed, 76, and Cynthia, 75, were “green” long before most folks even knew what it meant. 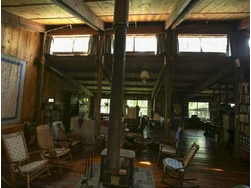 When they were young in the 1970s, they – well, mostly Ed – built their house themselves. They say they were inspired by articles in the Whole Earth Catalog, a counterculture magazine of the time. So, when the two heard of a new program of the Purdue Extension’s Allen County office to certify sustainable gardens, they were soon on board. “We enjoy wildlife and birds, and we wanted to promote sustainable living,” says Cynthia, a master gardener and master naturalist who continues to teach about wildlife at Fox Island County Park. The couple say they were a bit intimidated when they received a nearly 50-item checklist of sustainable practices. But they easily accumulated 61 points – the three-star, or next-to-highest, level – without having to do much of anything different or additional, Cynthia says. Use compost as mulch or fertilizer in gardens or lawns? Check. Remove or replace a problem tree? Check. Interplant flowers and vegetables? Check. Have raised-bed gardens? Check. Include native plants in landscaping? Check – and immediately apparent from the bright-orange cluster of flowering butterfly milkweed in a bed at the end of the driveway. Master gardener Pam Snyder of Fort Wayne, a coordinator of the certification program, says best gardening practices relative to the environment have been changing rapidly. She says members of the local extension committee that drew up the certification checklist wanted to promote their wider use. She and the committee began two years ago to research sustainable practices with the certification program rolled out this year. With minimal publicity, eight homes and businesses in Fort Wayne and Allen County have been certified, says Ricky Kemery, horticulture educator for the extension and program adviser. The “modest goal,” he says, is certifying 10 properties in the first year and aiming for additional homes and businesses and neighborhood organizations in upcoming years. People qualify for certification by gathering points in three checklist categories: Vegetable and Flower Gardens, Lawn and Landscapes and General. In the latter category, points can be garnered for patronizing a farm market or Community Supported Agriculture grower, buying organic produce, joining a local environmental organization or using the Extension services. The former two categories include more land-specific practices. They include not using cypress or dyed mulch, leaving grass clippings on the lawn, mulching leaves into the lawn or garden plots, planting drought-tolerant species, using low-phosphorous and/or corn gluten lawn and garden fertilizer and removing invasive plants. Homeowners are sometimes asked to provide documentation of their practices in the form of photos, bills or receipts. And an evaluation team from the Extension visits the property before certification is issued. The certification form comes with a sheet of definitions and resources for homeowners to use in making changes. So far, the main reward for participation is bragging rights, Kemery says – and a nice plaque. But certification also offers other incentives – free or discounted perennials at Riverview Nursery in Spencerville, a guide to ACRES Land Trust preserves and a map of Eagle Marsh Trails. Cynthia Powers says she can’t imagine a reason not to be on board. As she leads a visitor around her yard, she points out a busy hummingbird feeder and a bee box on a pole – a home for small native pollinators. She shows off the native Virginia creeper she uses as ground cover between her hosta plants and the wild ginger that grows without a lot of encouragement. A native prairie mix she sowed in one of her raised beds is growing tall. Then there’s the native redbud that was recently planted. And there’s where invasive honeysuckle used to grow – before Ed, a retired engineering company draftsman, pulled it out. In the couple’s 40 years on the property, she says, the two, both avid birdwatchers, have documented more than 120 species of birds on or over the land. 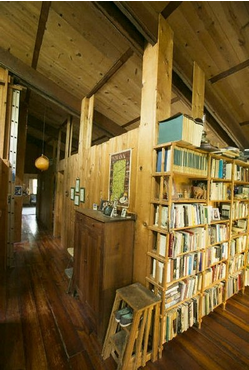 Ed Powers – who, 40 years ago, recycled maple wood out of Portland Forge and Foundry for his kitchen cabinets and incorporated passive solar principles into his family’s house – decides to add his two cents’ worth. Jim Haw was in junior high when his best friend took a unit on birds in a science class. His friend was interested and wanted to check out the birds around their houses. Now in his 60s, Haw, who is retired from teaching U.S. history at IPFW, typically goes birding three or four times a week. About 420 species have been seen in Indiana at least once, according to Haw, who is the director and field trip coordinator of the Stockbridge Audubon Society. Jim Haw has been birding for several decades and joined Stockbridge in 1972. Then, it was a purely local club, but has since become a chapter of the National Audubon Society. The chapter has meetings with programs and field trips and is involved in conservation and community outreach. The field trips take place most Saturdays and a few Sundays during the spring and fall (migration seasons). Stockbridge does the Christmas Bird Count, which is part of the Audubon Society's yearly count, as well as a May Day count to see how many birds are in the area for the summer months. Haw says members typically bird in areas they believe to be productive, noting which birds they see, and try to help everyone in the group see a bird. Haw has seen 294 species of birds in Allen County. “Many of us keep lists – a life list of all species we have ever seen anywhere, a state list for Indiana and perhaps other states, maybe a yard list of birds seen on our property, and an annual list,” Haw says. He says he enjoys noting the changes in range and numbers of species over the years and asking himself why the changes are occurring. “It's always fun to see an attractive bird or hear an attractive song, and bird behavior can be interesting,” Haw says. He says participants don't have to be a chapter member to take part in field trips. 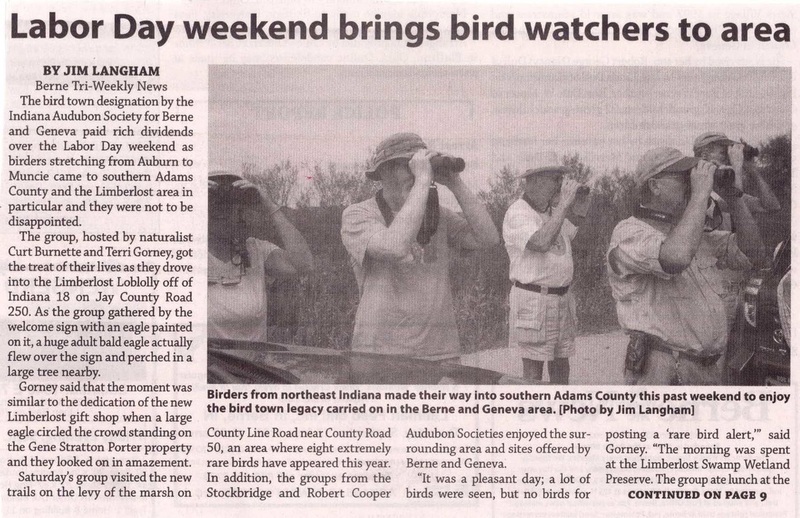 A person just needs eyes, ears and an interest in birding. They set up a net in the dark of night, and from the center of this net they play a recording of the mating calls for saw-whet owls. This is to lure owls into the net – not to be captured, but so that park officials can band them and keep track of the birds. One night in 2011, a young saw-whet owl later dubbed “Nightshade” ended up in this net and fought so ferociously and became so entangled the net had to be cut. And that’s when the bird came face-to-face with Alexandra Forsythe. “It really is adorable,” says Forsythe, who keeps a picture of Nightshade on the desktop of her computer. Three years later, Forsythe is 15 years old. She’s also a walking encyclopedia of everything bird. Did you know that owls cannot turn their head all the way around like some people think? Did you know birds help humans by eating mice and insects, or even dead animals or seeds like ragweed, or that they pollinate crops? Forsythe will be the first to tell you. Did you know the great horned owl is the only animal to eat skunks because those birds have no sense of smell? That’s because the moment with Nightshade is what caused Forsythe to go full force into birding – which is the spotting and identifying of birds in their wild habitat. She’s so into birding, and so driven and passionate, that she’s been named the Indiana Young Birders Club Birder of the Year for 2013 and also received the Charles D. Wise Youth Conservation Award from the Indiana Audubon Society. The teen gives presentations about birds to all ages of people and can name nearly any fact or dispel any myth about the creatures. “We don’t know where this came from,” says Forsythe’s mother, Cheryl Forsythe, who described her and her husband as now chauffeurs for their daughter’s activities. She said she and her husband never pushed their daughter into getting involved in activities, but somehow she found a passion for birds. And it’s led to them turning their Huntington home’s backyard into a habitat for many birds, with trails and trees spread throughout what used to be lawn. Forsythe volunteers for several organizations, including the Soarin’ Hawk Raptor Rehab and has created and run several websites dedicated to her feathered friends. 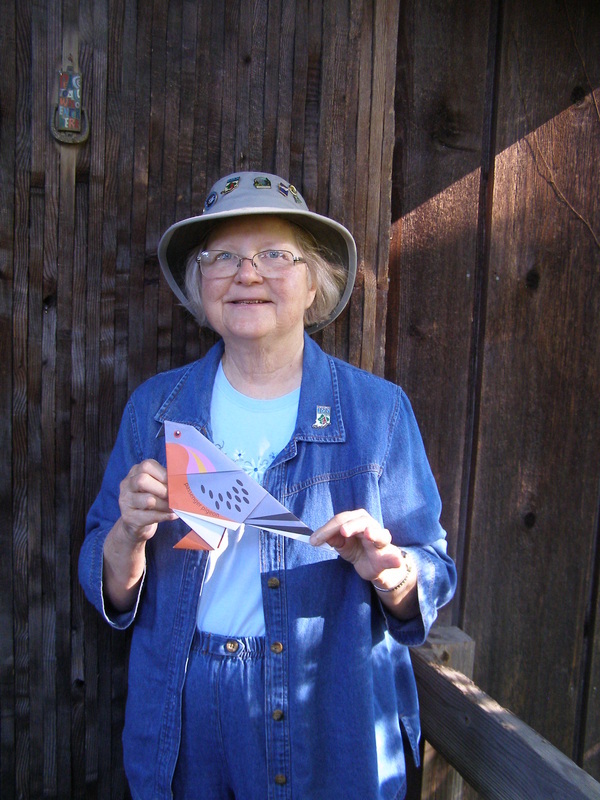 While she still loves owls, she also has a penchant for colorful warblers, hawks and sparrows. But basically, she finds something special “about every bird,” she says. Outside of birding, the teen has taken up dancing, even participating in several events that allowed her to show off her new ballroom dancing skills. And despite her young age, she knows she wants to end up in veterinary school and ultimately wants to help the birds that got her first interested in the animals: owls. And it’s all thanks to one little owl on a random night in 2011, an owl dubbed Nightshade by a bright and up and coming birder. Who never looked at the birds the same again.